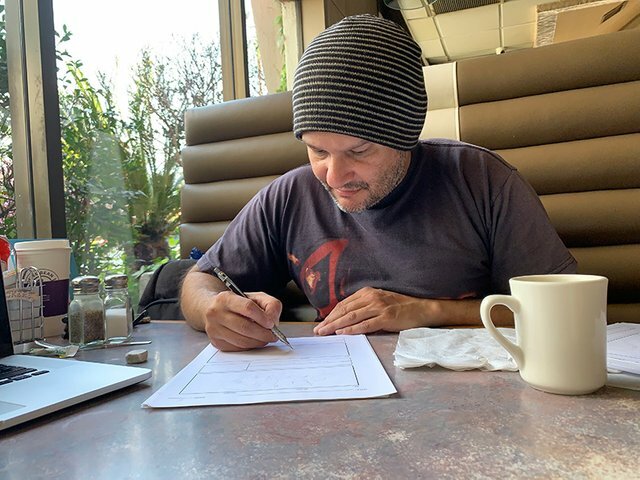 Finally started feeling better after hacking my lungs out for two days, just in time to meet Neil D'Monte, story board artist and director. I've been working with Neil for a long time. We have a very easy way of working together. He's as much a filmmaker as he is still an enthusiast of film, so he carries an infectious love for movies. There's nothing worse than working with a bunch of snobs and cynics. Neil and I met at House of Pies - there is a video coming that features the place - which couldn't excite me more. I'm weird. I love diners. I especially love diners drenched in nostalgia and laden with pies. HoP satisfies my odd fetish in spades. 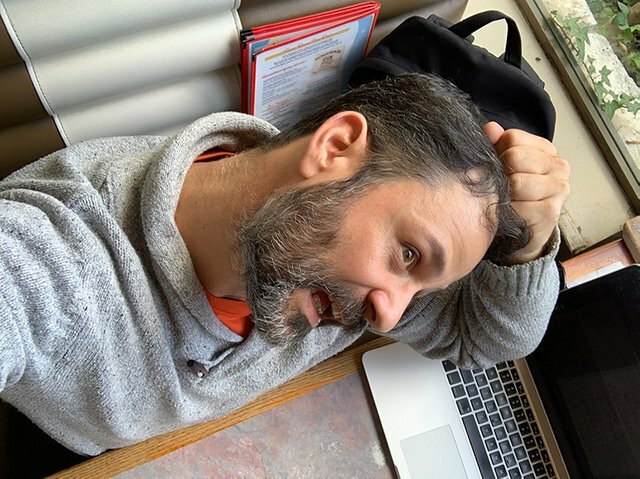 We're storyboarding the only part of the film I can afford to, the creature transformation, so I don't think we'll go beyond thirty or so boards. He's already cutting me a deal, but I can photo-board the rest for nothing. What I want to show are the kinds of effects we need to achieve for each shot and create, not just a camera or character action, but also a guide to show the quantity and quality I desire. These effects greatly... effect the budget, so this is the easiest way I can figure out what I can afford with my special effects artist. Spending money to save money seems like a wise investment. In this shot, I'm posing for Neil using my phone camera. The action is Father Smith's pulling Judith's hair back to expose her neck so he can drink her blood. 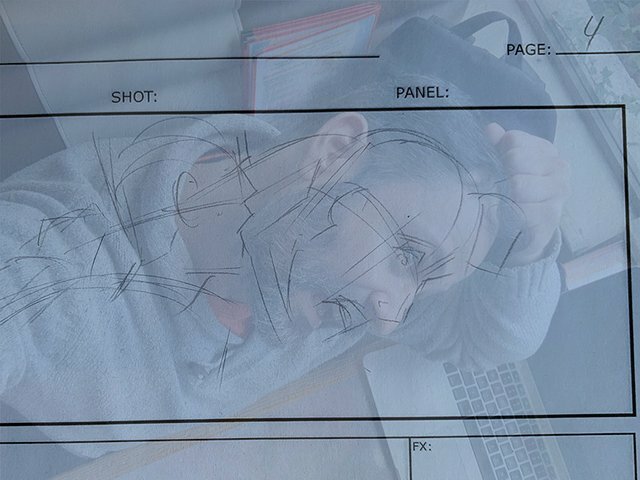 My left hand is serving as Father Smith's right hand in the storyboard and my face, Judith's. Here's an overlay of the storyboard's character scaffolding. These rough figures will become fully sketched out in the next week using our actors as the models, so they should resemble each other! That vague figure to the left is Father Smith suckin' on Judith's neck. GROSS! Very much looking forward to all the gory detail that Neil is going to add. He's a huge fan of horror films so I know he'll do each frame justice. Below is a board Neil did for me years ago for my screenplay "Kilogram". I've always wanted to make it but it turned out to be too expensive, so I'm holding onto the idea for a feature film. We ended up storyboarding the entire film actually. I asked Neil to give me less detail in these boards to reduce the cost, but I still think it's great. It conveys everything required to communicate the shot I want, which in the end is all I really need. I think this illustrates (Yeah, I went there. What of it?) how good these boards will be. I'm asking Neil to give these Changelings storyboards a lot of detail to remove ambiguity about the effects. These boards are also much larger than the ones we usually use, so I think they'll make great perks for the crowdfunding campaign. Time to go rest. I'm hoping by Sunday this cold is totally gone. It would be awesome to see more BTS posts like these. I love witnessing the process, these little steps of story-boarding and discussion; slowly painting a picture of the final thing. I'm sure others would love to see it, too! This type of thing is quite rare on here, I find. I’ll be sure to do some more posts like these. I usually try to do BTS stuff on video, but this was fun to write up. Thanks! Awesome post! Love how you share the process. I prefer this style over video ( to be honest ), might actually save you some time to write instead of vlog ( or perhaps I'm wrong ). 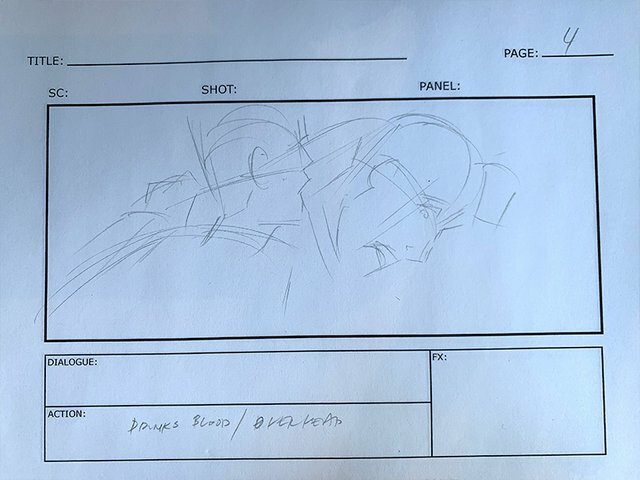 How cool to hear that you've got a storyboard of an entire project, even though it hasn't been made yet. Hey! Yes. Thank you. Still coughing crap up but I’m back at work. That said, I’m probably going to have to push my crowdfund another month. I still have more to do to make the crowdfunding effort effective. Health is more important than anything. Take your time and take it easy. Your project is not gonna run away.